Trump Pledges to Withdraw U.S. Ground Troops from Syria—But Global Powers & Deadly Air Forces Remain | Democracy Now! President Trump has ordered the withdrawal of all 2,000 U.S. troops in Syria, shocking many in Washington and around the world. On Wednesday, Trump tweeted, “We have defeated ISIS in Syria, my only reason for being there during the Trump Presidency.” He ordered the withdrawal despite opposition from within the White House. We speak with Yazan al-Saadi, a Syrian-Canadian writer and researcher, who warns that U.S. military presence in the region will continue. “You might have a large chunk of the boots on the ground leaving, but it seems very clear that the American air power is going to remain,” al-Saadi says. NERMEEN SHAIKH: We begin today’s show looking at Syria. On Wednesday, President Trump ordered the withdrawal of all 2,000 U.S. troops in Syria, in a move that surprised many in Washington and around the world. Trump tweeted, quote, “We have defeated ISIS in Syria, my only reason for being there during the Trump Presidency.” He later posted a video on Twitter explaining the move. PRESIDENT DONALD TRUMP: We’ve been fighting for a long time in Syria. I’ve been president for almost two years, and we’ve really stepped it up. And we have won against ISIS. We’ve beaten them, and we’ve beaten them badly. We’ve taken back the land, and now it’s time for our troops to come back home. AMY GOODMAN: President Trump ordered the withdrawal despite opposition from within the White House. In September, Trump’s national security adviser, John Bolton, said U.S. troops would stay in Syria until Iranian troops and its proxy forces leave. While Trump claims ISIS has been defeated, a report by the United Nations in August found up to 30,000 ISIS fighters remain in Iraq and Syria. President Trump’s move has been praised by some in the American peace movement and some progressive lawmakers, as well as anti-interventionist Republicans, including Senators Rand Paul and Mike Lee. But other Republican lawmakers have openly criticized Trump, like his ally Senator Lindsey Graham, who said, “An American withdrawal at this time would be a big win for ISIS, Iran, Bashar al-Assad of Syria, and Russia,” unquote. In addition to the fight against ISIS, Syria remains the center of multiple proxy wars involving the United States, Russia, Iran, Turkey, Saudi Arabia, Israel and other nations. NERMEEN SHAIKH: Trump’s announcement to withdraw U.S. troops comes just days after Turkey threatened to launch an offensive against U.S.-backed Kurdish fighters in Syria who have been battling ISIS. Erdogan said he wants to clear Turkish fighters from east of the Euphrates. Trump’s announcement also came one day after the State Department announced it had approved the sale of a $3.5 billion Patriot missile system to Turkey. One Kurdish commander told The Wall Street Journal he fears Trump’s move will be a green light for Turkey to attack the Kurds. Meanwhile, the Kurdish-led Syrian Democratic Forces criticized the U.S. withdrawal, saying it could lead to ISIS rebuilding itself. Earlier today, Russian President Vladimir Putin said he agreed with Trump’s decision. PRESIDENT VLADIMIR PUTIN: [translated] Is the presence of American forces in Syria necessary? I think not. Let us not forget that their presence, the presence of your American forces, is not legitimate. It is not acknowledged by United Nations Security Council resolution. Military forces can only be there by decision of the U.N. Security Council or by the invitation of the legitimate government of Syria. We are there at the invitation of the Syrian government. They have needed this, not that. So if the U.S. decided to withdraw their forces, that is correct. AMY GOODMAN: Putin was speaking at his year-end, multihour news conference in Moscow. To talk more about Syria, we’re joined by two guests. In Beirut, Lebanon, we’re joined by Yazan al-Saadi. He is a Syrian-Canadian writer and researcher. 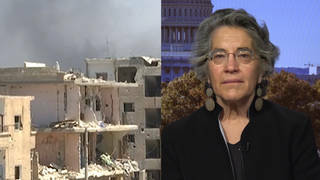 And in Washington, D.C., Phyllis Bennis is with us, fellow at the Institute for Policy Studies, has written a number of books, including, most recently, Understanding ISIS and the New Global War on Terror. Let’s begin with Yazan in Beirut. Your response to this surprise announcement, that apparently not only shocked the political establishment in Washington, but the Pentagon and the State Department, as well? Your thoughts on President Trump saying, starting now, he is immediately removing 2,000 U.S. troops, beginning with State Department employees being evacuated immediately? YAZAN AL-SAADI: So, yeah, there are plenty of thoughts I have. We can start with the idea that’s in my head, is that I don’t really think there is going to be a full withdrawal, because people assume that, finally, the U.S. is going to be out. You might have a large chunk of the boots on the ground leaving, but it seems very clear that the American air power is going to remain. The U.S.-led coalition itself, whether it’s France or the U.K., are going to be on the ground. So, the idea of this full American withdrawal, I think, is a bit simplistic. And the way I see it, as well, and the analogy that comes to mind, which is based off history, if we look at the history of U.S. military interventions throughout the 20th century, when it happens, it’s sort of like what happens next is that it’s sort of like an STD: You have herpes, where the Americans never leave. And this is true when you look at cases of Japan or Cuba, Guantánamo Bay. So I don’t think the Americans are fully withdrawing. And I think we have to be careful about that. One key concern, obviously, is the destructive air power that has been decimating a lot of innocent civilians. Raqqa is a great example of that. And what this means on the ground, I mean, what we’re going to see, obviously, is that the Turks are going to leap on this, in my opinion. They’re definitely going to use that opening to push forward in Manbij, east of the Euphrates, and you’re going to have an increase of violence there. The Assad regime itself, with its Russian and Iranian allies, are going to try and push forward, as well, against the PYD, or maybe the PYD will make a deal with them. But I think the situation isn’t really going to be better. This doesn’t mean that the U.S. soldiers should remain. I’m fully against any presence of the U.S. soldiers, just like I’m fully against the presence of the Russian soldiers. And I like how Putin talks about a legitimate government determining the presence, but I don’t think Assad is legitimate. And if we follow along that line, then, well, does this mean the Saudis should remain in Yemen? I don’t think so. So, there’s a lot that’s going to happen. We have to be really careful. And I think all this, what’s driving it, really isn’t about a mission accomplishment or caring about what’s happening in Syria. I think this could be related to the multiple scandals that are brewing, multiple pressures on Trump. It could be related to so many other things. But I don’t think the U.S. is ever going to leave. Like I said, it’s an STD, in many ways. NERMEEN SHAIKH: So, you’ve also suggested, Yazan—do you think it’s likely that the U.S. might even escalate airstrikes once, and if, the troops are withdrawn? YAZAN AL-SAADI: Yeah. I mean, the airstrikes—yeah, there were comments by senior officials and senior military officials that talked about the continuation of airstrikes. And I think you might see an increase. Yeah, most definitely, you will see an increase, because, well, the boots aren’t on the ground, so they won’t have to worry. And they just, you know, do what they do, and they bombard the place, like they did in Mosul and Raqqa, which is utterly devastating. I don’t think the solution here really is more war, personally. NERMEEN SHAIKH: And, Yazan, what about how you think this might impact Russian and Assad airstrikes in areas that are not yet fully under government control? NERMEEN SHAIKH: Because, of course, the concerns that have been expressed here are that, basically, by Trump making this announcement, he’s giving a green light to Assad and to the Russians and to everyone who’s been backing the regime. YAZAN AL-SAADI: I mean, that could be very well true. Let’s not forget that there is coordination between the U.S. and Russia and the Assad regime. This idea that there is a U.S. conspiracy to overthrow and regime change in Syria, I don’t think that’s true. But, I mean, what you might see is maybe the PYD being forced to make a deal with Assad and the Russians in order to protect them from the Turks. AMY GOODMAN: And explain who the PYD are. YAZAN AL-SAADI: Ah, the PYD is the Democratic Union Party. It’s a Kurdish-led party. There are many different Kurdish parties in Syria, obviously. This is a Syrian—this is one of them. It’s the strongest force on the ground. The PYD is the political arm of the SDF, which you mentioned earlier, the Syrian Democratic Forces, that are in the north and northeastern part of Syria all the way down to Deir ez-Zor, because they took the fight to ISIS. So, I feel like this is also a lesson that the PYD should have realized, because any partnership with the U.S. is always—it burns you. And this is something that we’ve seen in history time and time again. A lot of U.S. allies, throughout the 20th century and beyond, tend to get burned, because the U.S. tends to care about itself and sells you out. But this is something that most superpowers do anyways. So the PYD is learning a hard, harsh lesson, really. AMY GOODMAN: You mentioned the Kurds. And many are talking about conversations the president has had with Tayyip Erdogan, the president of Turkey, who knows what went on behind the scenes around the murder of Khashoggi, with Erdogan putting out the video of his murder by a Saudi hit team in Istanbul. But what are Erdogan’s concerns about the U.S. working with the Kurds in Syria? And what are Turkey’s plans now? YAZAN AL-SAADI: Well, Erdogan’s concerns, obviously, for the Turks—we need to understand a bit of history, because there’s a really long, dark history in terms of dealing with Kurdish rights and Kurdish representation. So, the PYD, as a force of—a Kurdish force that is militarily strong and growing due to the vacuum that happened over the years, this was a major security concern for the Turks. So the Turks started backing various rebel—Syrian rebel groups against the PYD. So these discussions are happening. What I find interesting is that, today, the Iranian president is in Turkey, and they just had a press conference. So it seems like there might be more coordination, because the Iranians themselves aren’t really interested in Kurdish autonomy, because that might affect the Kurdish community there. Neither does Iraq want that. And neither does the Syrian government, in many ways. So I think there is going to be a support of the Turks going in, to a degree. And there might be coordination in order to ensure that there isn’t going to be a spillover battle between the Turks and the Russians and everyone else. And I think the biggest victim will be the PYD, for many reasons. NERMEEN SHAIKH: And what is, Yazan, if you could say—I mean, as you mentioned, Rouhani, Iranian President Rouhani, is in Turkey today. What is the extent of Iranian involvement in Syria now? YAZAN AL-SAADI: I mean, the Iranian involvement is—been a long, long time. I mean, the relationship was built during the 1980s. The Syrian regime was the only—I think, one of the few Arab governments, or the only one, that really supported Iran during Iran-Iraq War. And this relationship has developed a long, long time. So, what are the Iranians doing in Syria? They are playing as advisers. You have some fighters. They’re sending in foreign fighters, whether it’s Afghan militias, because they promised them nationality, or the Iraqi Shia militias that were brought in. So you have that. And the Iranians are playing sort of a political-military coordinator of sorts to give backing and protection for Bashar al-Assad. Obviously there is Hezbollah in the mix, as well, which is part of that. So the Iranians are definitely trying to ensure their interests, regardless of what happens in Syria. And ultimately—and I think this is a very key point—with all these like power games played by all these countries and leaders—revolting men, they are all—the biggest losers, obviously, are communities in Syria, whether they are Kurdish, Arab, Armenian or whatever, because the struggle for self-determination and actual freedom is really taking a pounding here. And it’s taking a pounding by all sides. AMY GOODMAN: Finally, before we go to break, Yazan, I wanted to ask you about President Trump saying that ISIS has been destroyed, many people calling this that George W. Bush moment when he said “mission accomplished” in Iraq. YAZAN AL-SAADI: Yeah, I mean, it’s like—you know, it’s a very Trumpian moment. I mean, he said it on Twitter. Wonderful, great. I don’t think, I mean, whether—regardless if the U.S. remains or leaves, what is the problem in battling ISIS is the same problem we’ve been seeing since the start of the global war on terror 17 years ago. And you cannot defeat extremism and terrorism with war. You need to offer alternatives. You need to deal with the core issues that are driving these things, which is political issues, social issues, economic issues—true liberation and representation for the people and communities. And this is a major failure we’re seeing, whether from, you know, the states—not just the U.S., I’m talking about nation-states, internationally. And the problem, as well, is that the global war on terror mentality, discourse, ethos has been appropriated by a lot of governments worldwide. And it’s been utterly destructive. I mean, I was thinking about it. There is like a tragic reminiscence of like al-Qaeda. It seems like al-Qaeda was a cup of tea compared to what we’re seeing today. And I do think we’re going to see worse things tomorrow, because the key issues aren’t being dealt with, and these powers that be are really not interested in dealing with them, because this means a complete change of the status quo. This means changing core issues, whether it’s discrimination, injustice—all these things. So, they’re not interested. And actually, they benefit by having this continual enemy. They always benefit, and we get screwed as people. AMY GOODMAN: Yazan al-Saadi is a Syrian-Canadian writer and researcher, speaking to us from Beirut, Lebanon. When we come back, we’ll also be joined by Phyllis Bennis of the Institute for Policy Studies. This is Democracy Now! Back in a minute.